This firmware update improves the performance of the unit and enhances the reception of some regional services. 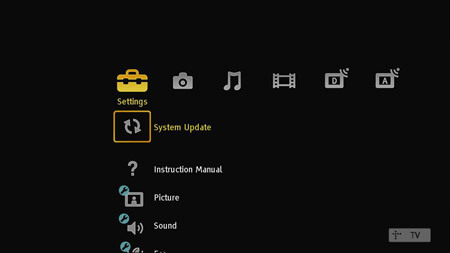 Power on the TV set and press the HOME button on the Remote Commander to display the Home Menu(XMB™). When the update download is complete, check that the file size is 36.145.144 bytes. Press HOME on the Remote Commander. If the version number shown on the third line is M8.728, your TV set has been correctly updated. For the upgraded firmware to take effect, customers using cable connection must re-install the TV by initiating Auto Start-up. If you select "Cable", the screen for selecting the scan type appears. Quick Scan: channels are tuned according to the cable operator information within the broadcast signal. This option is recommended for fast tuning when supported by your cable operator.If the "Quick Scan" does not tune, please use the "Full Scan" method below. Full Scan: All available channels are tuned and stored. This procedure may take some time.